Eating the Bible: Gifts of Contrition? Rena created beautiful chicken packages filled with pistachio and almonds to complement Genesis 43:11. The definition of contrition is sorrow for sin arising from fear of damnation. The gifts given to Joseph from his brother were not gifts fit for a king, but rather a care package from home. The foods native to Israel are considered to be a symbol reminding Joseph of his betrayal; an effort to make him feel guilt. Contrition is not a concept I agree with. And a God to be fearful of is not one I want to believe in. I can understand that religion and God is often used to impart “right” and “wrong”, especially on children, but I do not believe in using fear as a way to teach morality. One of my favorite quotes is, “Integrity is doing the right thing, even when no one is watching.” by C.S. Lewis. And that philosophy is how I view God. I don’t make my decisions based on fear of God, I don’t do what I think it right because God would want it to be that way. I’d like to think that God is judging me on who I am, not who I am because of a fear. I think genuine actions are the most important. Cut chicken breasts in half to create 6 thinner breasts. Spread 1-2 tbsp of nut mixture on each chicken breast. 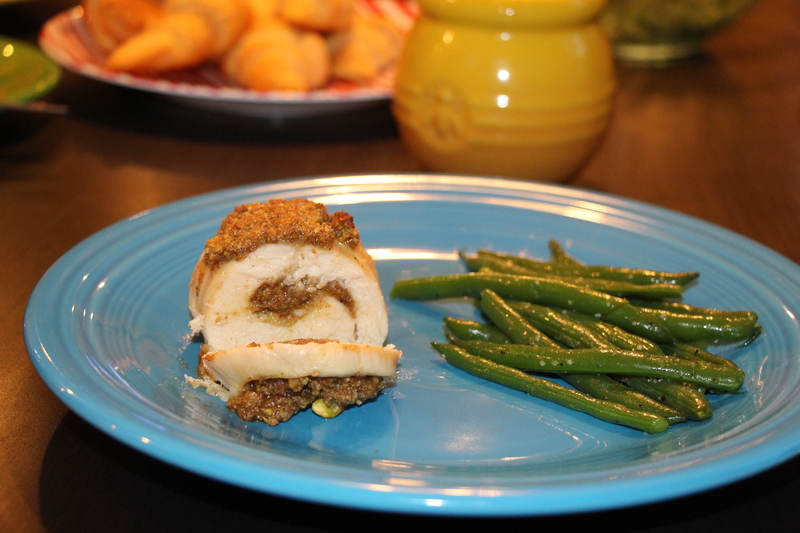 Roll chicken and place in a greased baking dish. Top with any remaining nut mixture and drizzle with honey. Bake 30-35 minutes. The nut mixture would be great placed in crescent rolls too!